Annelie Hornbostel completed her Graphic-Design Studies at the Braunschweig University of Art, Germany. She also visited the faculty for free art as a guest student. Annelie Hornbostel received her diploma in 1978, where she put her main focus on illustration. She did project-related collaboration with the Institute of Psychology in Braunschweig. After university she did freelance work and was working on a project-by-project basis in several graphic studios. From 1980-1994 Annelie Hornbostel was also working as a photographer and as a draftswoman for technical surveillance tasks on archeological excavations. 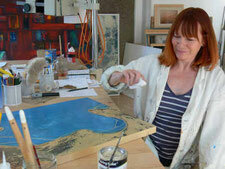 Annelie Hornbostel put her main focus on painting since 1998. She has had exhibitions in Braunschweig, Eschwege, Kassel, Korbach, Goslar and Bremen. Annelie Hornbostel lives with her family in Kassel since 2004.